The Bill & Melinda Gates Foundation, leading impact-driven advisory firm, Dalberg, and The Centre for Social and Behaviour Change at Ashoka University have launched a public data set and tool to enable better design for financial health in India. It is unique in using a multi-method research approach including human-centered design, cognitive psychology, behavioral science, and large-scale survey-based methods together to understand consumers. Titled Aspiring Indians, this is the India chapter of The Human Account, a robust, holistic resource with data and insights covering six countries in Asia and Africa. Using a nationally representative sample, Aspiring Indians surveyed 3,300 respondents in 16 states to come up with critical insights, six key consumer segments and further developed six prototype financial products that meet the needs of the consumers of each segment. This study suggests that financial services need to be better designed and we need to do so by deeply understanding the needs of the financially underserved. There is also a need for more collaborations to improve the future of segmentation and financial health. Financial services providers can use Aspiring Indians to identify which consumers might be suitable for an insurance or credit product, which ones are likely to be long time savers, or early adopters of digital technologies. 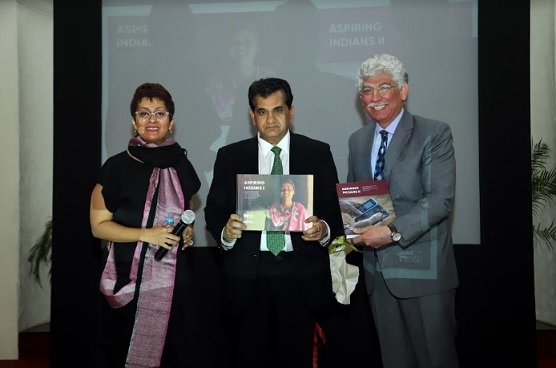 Aspiring Indians was launched on 11th February 2019, at ‘Decoding Consumer Behaviour to Drive Financial Health’, an invitation-only event attended by executives from financial services, the public sector and the media. Guided by the belief that every life has equal value, the Bill & Melinda Gates Foundation works to help all people lead healthy, productive lives. In developing countries, it focuses on improving people’s health and giving them the chance to lift themselves out of hunger and extreme poverty. In the United States, it seeks to ensure that all people-especially those with the fewest resources-have access to the opportunities they need to succeed in school and life. Based in Seattle, Washington, the foundation is led by CEO Sue Desmond-Hellmann and Co-chair William H. Gates Sr., under the direction of Bill and Melinda Gates and Warren Buffett. Dalberg Advisors is a strategic advisory firm which brings the best of private sector strategy skills and rigorous analytical capabilities with deep knowledge and networks across emerging and frontier markets. They work collaboratively across the public, private and philanthropic sectors to fuel inclusive growth and help clients achieve their goals. Dalberg Design engages with people, communities, and organizations to design creative solutions that support their needs and aspirations for a better life. They use participatory methods to understand and address the root causes and complex systems that limit economic opportunity and human potential in under-served communities around the world. The Centre for Social and Behaviour Change (CSBC) at Ashoka University is set up by a grant from the Bill & Melinda Gates Foundation. The vision of the Centre is to establish an institution in India that is globally reputed for thought leadership and excellence in impactful behaviour change interventions for low-income and marginalized populations. The Centre is focused on bringing new capabilities such as behavioural science, human-centred design and predictive analytics to governments, practitioners and donors to help better design and optimize behaviour change interventions and programmes. For more information or to arrange interviews, please contact: Archna.Vyas@gatesfoundation.org.